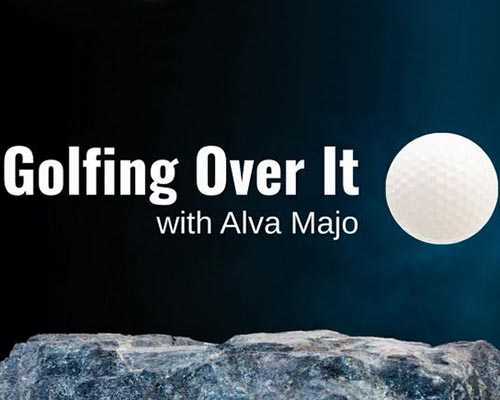 Golfing Over It with Alva Majo is an Action, Casual and Platformer game for PC published by Majorariatto in 2018. Play a different golf game. A golf ball will be under your control during the game. You need to hit lots of obstacles on your way with this ball. Golfing Over It with Alva Majo is a discouraging game about climbing a surreal mountain with a golf ball, a different take on 2017’s hit Getting Over It with Bennett Foddy. Experience the challenge of climbing an unyielding mountain without infuriating controls being part of that challenge. Bennett Foddy has played this game and granted it his blessing. If you needed more things to get over, this game will provide you with a fresh set of challenges. This time you must send the golf ball flying. It may sound simple enough, and even at first you might think this will be way easier than Getting Over It with BF, but the real challenge soon emerges – air-juggling. As long as the ball doesn’t hit anything in mid-air, you can hit the ball as many times as you want (with a few caveats). In essence, you’re multi-jumping in a very cumbersome, but fair fashion. This game is a very thoughtful take on Getting Over It, with a different but no less rage-inducing mechanic. Which is golf. And everyone loves golf minigames almost as much as fishing minigames, after all. Golf your way up to the top. Listen as Alva explains why he made such a cruel game. Fall all the way back to the bottom. And if you manage to get to the top? 13 Comments ON " Golfing Over It with Alva Majo Free Download "
thank you for this game i watch markiplier play this soo…but.